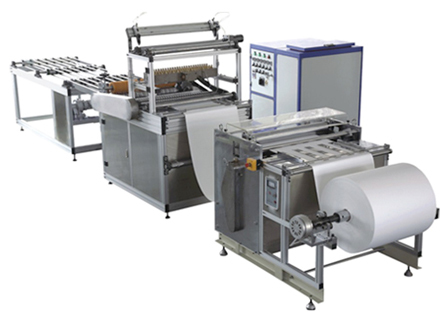 This machine is professionally designed and used for mini-pleating and hot melt dispensing on the fiber glass or polypropylene filtration materials, and is able to match different specifications of the filter elements, which is characterized with high productive efficiency and simple operation. 1.Both the fiber glass pleating and hot melt dispensing are on the same machine. The long conveyer belt and cooling fans are adopted after the pleating system so as for quickly drying the hot melt and cutting at any length. 8.High productive efficiency and good smoothness.